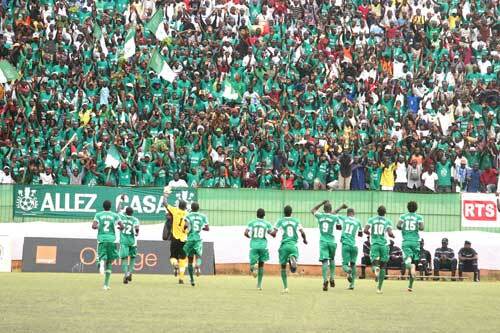 Casa Sport, based in Ziguinchor in Senegal south, is the champions of the Senegalese Ligue 1 2011-2012. From my point of view, Casa Sport is a team with several players that deserves attention. Maguette Gningue, formerly of Sharks FC in Nigeria, and Pape Souleymane Sané, formerly of Guédiawaye FC, are both experienced and confident goalkeepers. The central defensive pair of Abdoulaye Diallo and Mame Saër Thioune is simply brilliant at this level. I have seen Casa Sport once and the strongman Diallo immediately caught my eye . Mamanding Kidiera, often captaining the side, is arguably the main man in midfield, mostly with defensive responsibilities. Ismaïla Diarra Badji and Christian Pascal Diatta are key midfielders, while the talented duo of Pierre Benoit Aubia Manga and Dominique Mendy is about to blossom. Mendy has featured for the Senegal U-20 national football team this summer. There are several interesting attackers in the squad. The attacking trio of Emile Paul Tendeng, Aliou Coly and top scorer Pape Sané received a lot of praise througout the season. This summer, the creative Tendeng has been linked to FC Dinamo Bucuresti (Romania) while centre forward Sané has been linked to French third level side US Boulogne. Youssouph Coly and Siaka Sané have both featured for the Senegal U-20 national football team during the summer. Mamadou Diatta Ndiaye and Karim Ben Badji are two players to watch. Please note the following: Casa Sport played 20 matches during the season. However, the match against the Diambars Academy on 30.06.2012 was interrupted due to crowd violence and Diambars was awarded victory. Therefore, this match is not considered in the statistics. “Name” – the player’s full name. “Position” – position on the field, either goalkeeper (G), defender (D), midfielder (M) or forward (F). “Date of birth” – when only birth years are mentioned, these are based on estimates. “Nat.” – nationality. Unless specified, I assume all players are from Senegal. “Matches(d)” – number of matches I can document the player has been involved in. “Matches(e)” – number of matches, based on an estimate. “Goals” – only documented league goals. The picture was found on lequotidien.sn.